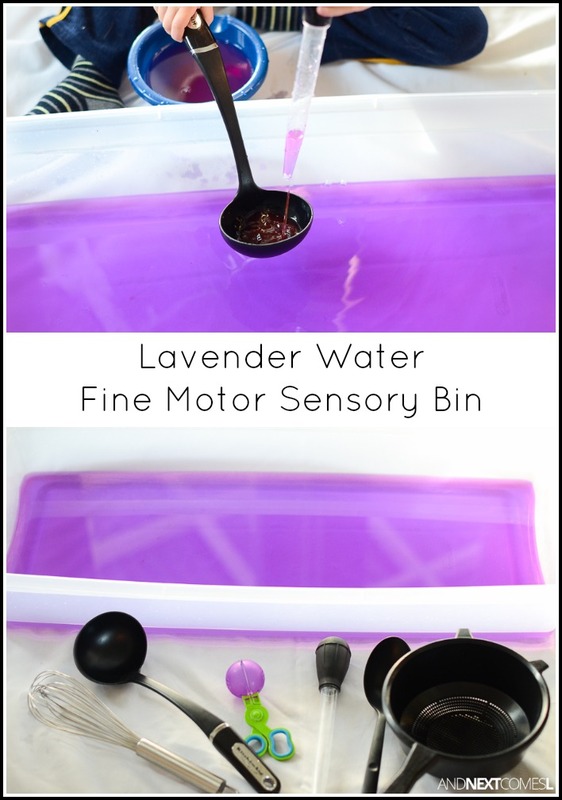 When I need a quick activity for my kids, I usually resort to a water sensory bin for a handful of reasons. First, water is versatile. 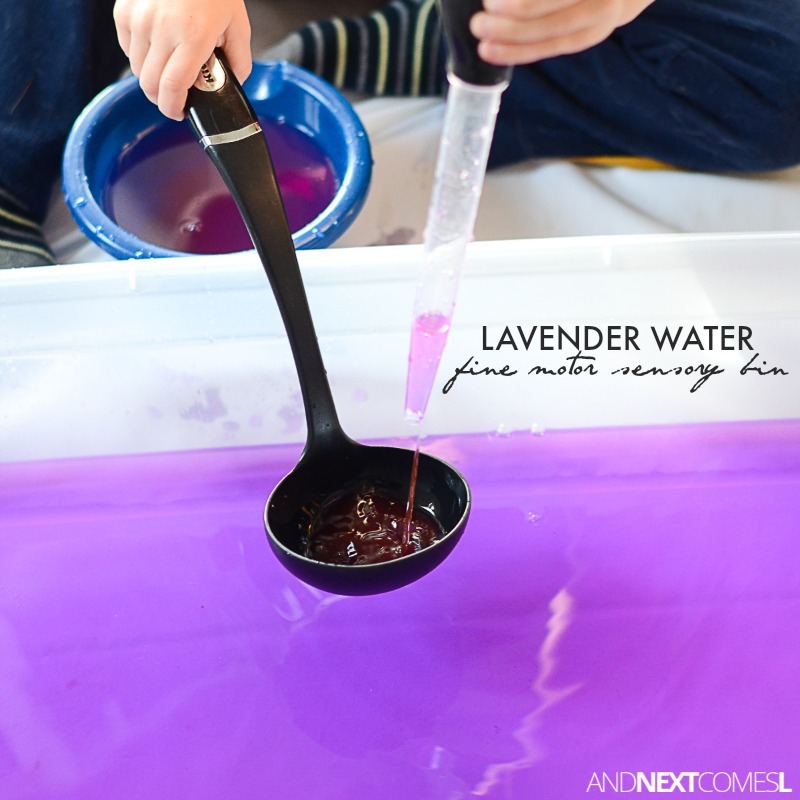 Anything can be added to it, such as coloring and scents. Second, it's great for working on fine motor skills. Third, it cleans up easy because well, it's water. Finally, my kids love playing with water and it keeps them busy for long periods of time. We've been on a bit of a lavender scented sensory kick lately with our lavender soap foam and lavender prewriting tray. So we ended up doing a lavender water sensory bin that focuses on developing fine motor skills. 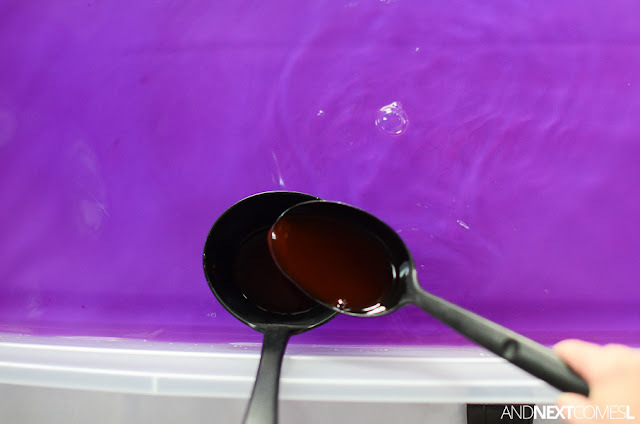 In a large plastic container, mix water with 5-6 drops of lavender essential oil and a few squirts of purple liquid watercolor. 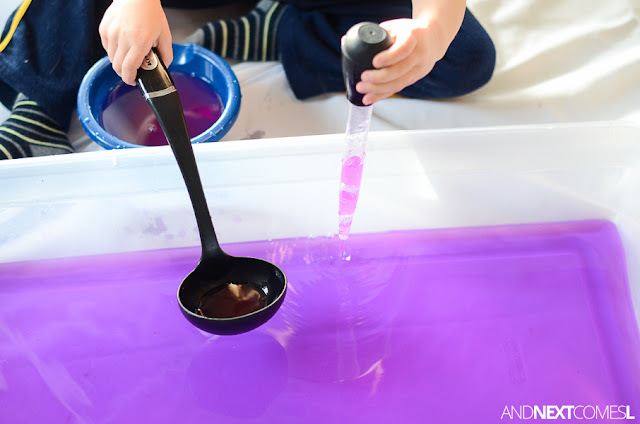 How much liquid watercolors you will need to add really depends on how dark of a purple you want and how much water you use in the sensory bin. 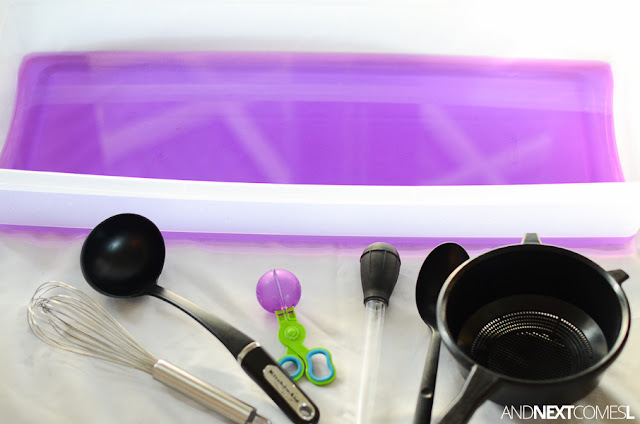 Once it's all mixed up, set out some tools for scooping, pouring, and stirring. 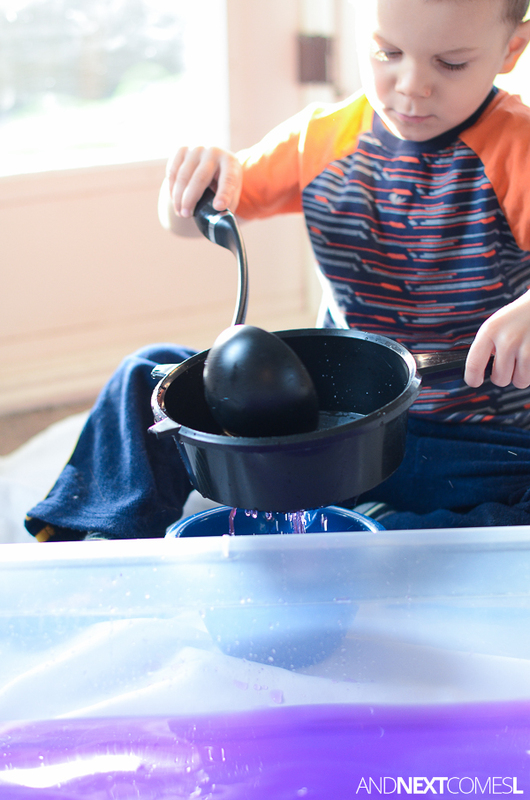 Four year old K has always been a fan of water sensory bins that encourage scooping and pouring, as evidenced by the various sensory "soups" that we have done over the past year or two. 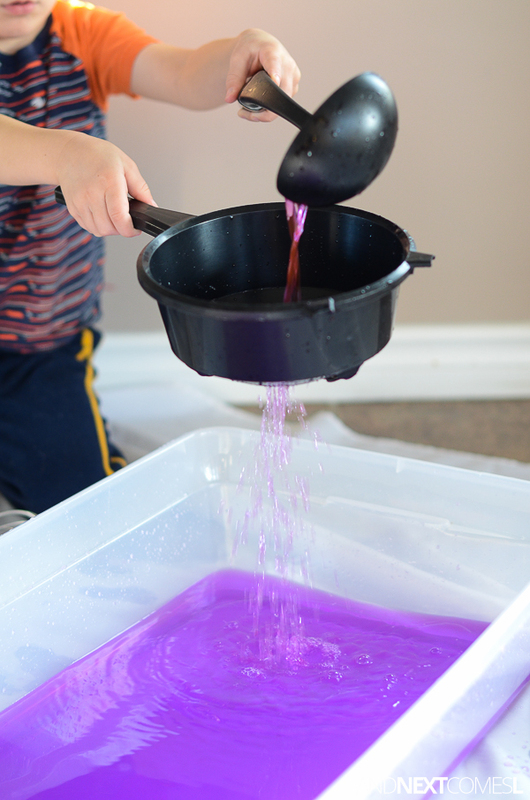 And it never fails, he always uses the large spoon to scoop water into the ladle, like below. 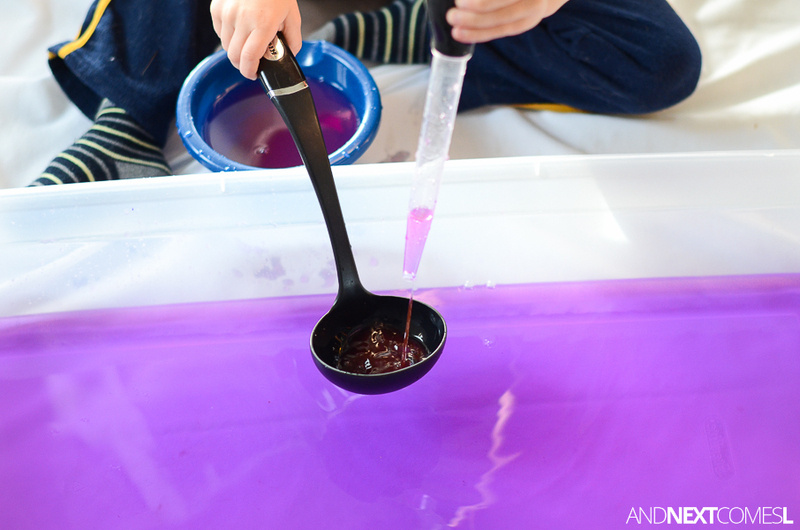 But he did mix it up a bit by using the turkey baster to transfer water to the ladle. The addition of the strainer was a nice treat for K. I originally didn't supply a bowl, but he went and grabbed one himself (how resourceful he has become!) and started scooping and pouring the water through the strainer. It was easily his favorite part!